The number of talks could be limited. The duration of contributed talks is 20 minutes. The length of mini-symposium talks and contributed talks will be the same. There will not be a formal refereeing process of abstracts. As a result, we expect that most of them will be accepted. If we do not let you know of the rejection of your contribution by Jun 18th, 2017, you may assume that it was accepted. You can check that your abstract was accepted or ask for an accepting letter by means of our on-line registration system. A book of abstracts will be given to all attendees. 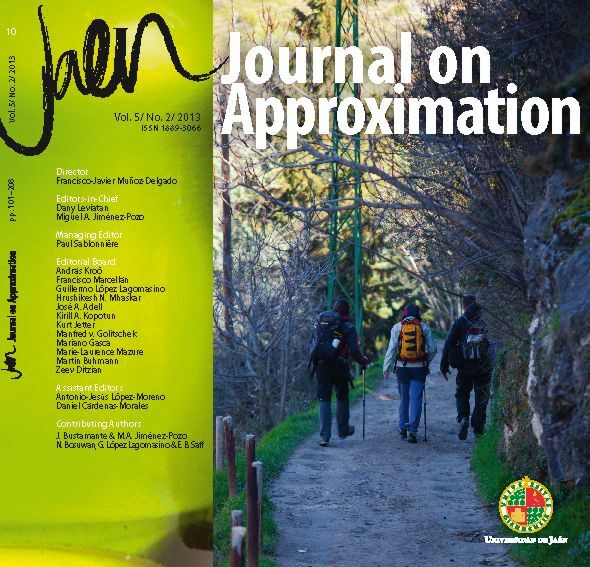 We will not prepare Proceedings of the Conference, but all the participants are invited to submit manuscripts (no necessarily about the subject of their talks) to the Jaen Journal on Approximation (please visit the web page of the Journal through the left-hand side menu). We very much appreciate your eventual submissions and we offer you reduced fees.